In 1957, Colonel-Doctor Irina Spalko and a convoy of Soviet agents posing as U.S. soldiers infiltrate a military base in the Nevada desert. They force Indiana Jones to lead them to a crate in "Hangar 51", which holds the remains of an extraterrestrial creature that crashed ten years before in Roswell, New Mexico. Indiana attempts to escape but is foiled by his partner Mac, who reveals that he is working with the Soviets. After a fight and an elaborate vehicle chase through the warehouse, Indiana escapes on a rocket sled into the desert, where he stumbles upon a nuclear test town and survives a nuclear blast by hiding in a lead-lined refrigerator. While being debriefed, Indiana discovers he is under FBI investigation because of Mac's Soviet ties. Indiana returns to Marshall College, where he is offered an indefinite leave of absence to avoid being fired because of the investigation. At a train station, Indiana is stopped by greaser Mutt Williams and told that his old colleague, Harold Oxley, disappeared after discovering a crystal skull near the Nazca lines in Peru. Indiana and Mutt go to a local diner, where they discuss Akator (also known as El Dorado), Crystal Skulls, and the Ugha tribe. Mutt passes Indiana a letter from Oxley. Soviet agents approach them, and a chase commences on the college grounds. Indiana realizes that the Soviets were trailing Mutt to get him to decode Oxley's letter. In Peru, Indiana and Mutt discover that Oxley was locked in a church-operated psychiatric hospital until the Soviets kidnapped him. In Oxley's former cell, Indiana discovers clues to the grave of Francisco de Orellana, a Conquistador who went missing in the 1500s while seeking Akator. Indiana finds the crystal skull that Oxley hid in Orellana's grave. The Soviets capture Indiana and Mutt and take them to the camp where they are holding Oxley, as well as Mutt's mother (and Indiana's ex-lover), Marion Ravenwood. 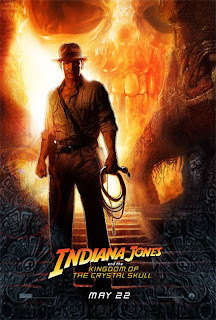 Indiana learns that the Soviets believe the skull, which magnetically attracts even non-ferrous objects, is from an extraterrestrial life-form and holds great psychic power; Oxley has suffered a mental breakdown due to over-exposure to the skull's powers. Marion reveals that Mutt's real name is Henry Jones III and that he is Indiana's son. The four escape from the Soviets, leading to a lengthy vehicle chase involving a sword fight between Mutt and Spalko, and a swarm of killer siafu ants. Escaping on an amphibious vehicle, Indiana, Mutt, Marion, Oxley and Mac arrive at the Temple of Akator, a Maya-style pyramid in the Amazon rainforest. Claiming that he is a CIA double agent working against the Soviets, Mac enters the temple with Indiana and the group, but he is actually leaving a trail of homing devices for Spalko to follow. them a "great gift". Spalko demands to "know everything", and the skulls begin transferring knowledge into her mind. As a portal to another dimension appears over the room, Oxley regains his sanity and explains that the aliens are inter-dimensional beings who taught the Ugha warriors their advanced technology. Indiana, Mutt, Marion and Oxley escape from the temple, but Mac and the soldiers are sucked into the portal. The skeletons form into a single alien which continues to feed Spalko with knowledge; however, the knowledge overwhelms Spalko, causing her to ignite and disintegrate, with her scattered essence absorbed into the portal as well. The temple crumbles, and a flying saucer rises from the debris and disappears as the Amazon river floods the valley. After they return home, Indiana is reinstated and made an associate dean at Marshall College, and he and Marion are married.